I would love to sit in a garden with you and just talk. If I had all the money in the world, I'd pay the Barefoot Contessa to cook for us and have a Starbucks Barista on call for our little garden chat. We'd eat up all the goodness that Ina would make and not worry about the calories. We'd have our personal Starbucks barista make us all the different secret recipe coffees just to taste. There would be a stack of magazines that we could look at while we talked...and there would be #selfies, definitely. We would sit together all afternoon and not worry what the kids were doing since I hired the ultimate nanny for the day. There would even be a pet sitter if you needed that, too. All the stresses of our life would be wiped away because we'd have a personal masseuse at our disposal. Our personal assistant would be dealing with our to-do list and our blog assistant would tackle the emails. Life on this perfect summer day would just be what we needed to rejuvenate us and set us up for the rest of the month. It would be bliss. We would be together and it would be good. I often wish we could do this. That we had afternoons like this. That our lives were much simpler than what they are. I like that I can imagine these things. That when I picture the perfect summer afternoon, you are included in that sweet dream. I like to imagine that one day I will meet you all in person. I like to think that every single afternoon of my life was booked with dates with each and every one of you. A lifetime of dates with my online friends that have become so much more than that. I don't know if it's pathetic or not, and I really don't care anymore, but I have noticed something. I don't really have a lot of in-person, in-real-life friends. I crave that sisterhood on the daily. I have one good friend. One. Just recently, I have added another, maybe. Yes, there are friends at work. But I've learned to separate my "friends at work" with my real life. These work friends stay at the office...and that's okay. They help me survive the work day. At home, I live with my best friend - my husband. No, really. He's my best friend. He's the friend I've known the longest and I love him. Win-win. Outside of family, it's slim pickings. For once in my life, I'm okay with that. I know it's because I have this online family. When I need connection, I just go on Instagram or Facebook or here and I find it. I go to my go-to blogs for a good read. I have more conversations by text message, comment or email than I do real live conversation. Some of you, I have never actually heard your voice or given you a hug. Some of you, I have. But virtually, I know if I need to talk, vent, or just visit you...I just pick up my phone and there you are...instantly. That gives me peace. That makes me happy. That is all that matters. Because at the end of the day, when all else fails, there you are. 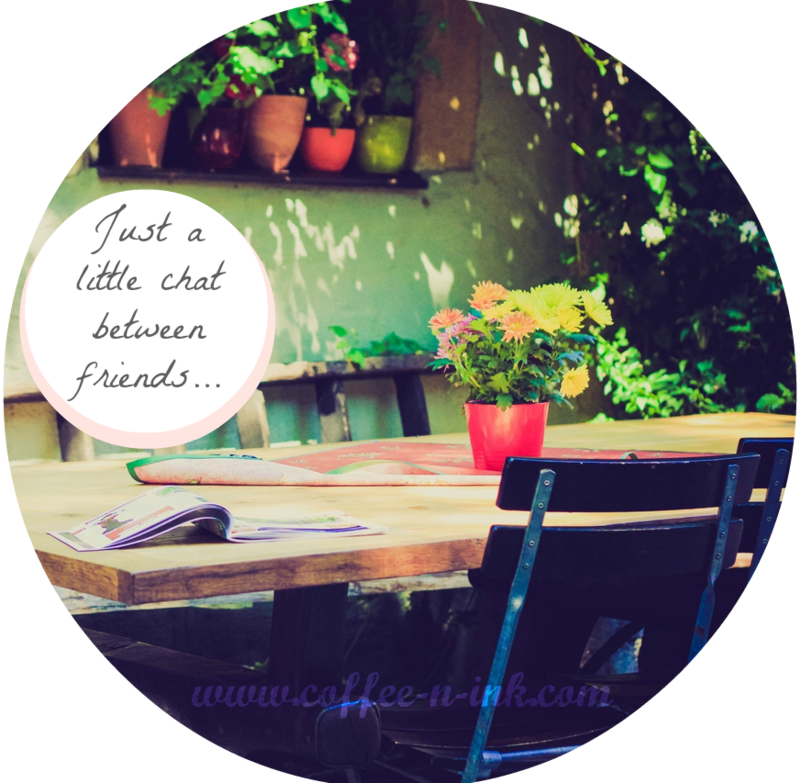 Sitting with me in our imaginary virtual world, eating scrumptious treats by our personal chef and enjoying our special talks. Period. That sounds like an amazing day! Lets do it! ;) I count you as a friend! I'm so glad that we had the opportunity to meet and get to know each other a little bit better in real life! Love your writing! If this day ever happens, please let me know. I'll be on the first place to CA! I've spent the last 10 years in the military or working for the military so every friend I've ever made has moved away. My only friend that I've had in the last 3 years just moved to Florida. Online friends help a lot and I can still have a smile on my face each day because of them. It's not pathetic at all. Sounds absolutely glorious! Count me in!